I have a powerful zine in my hands. 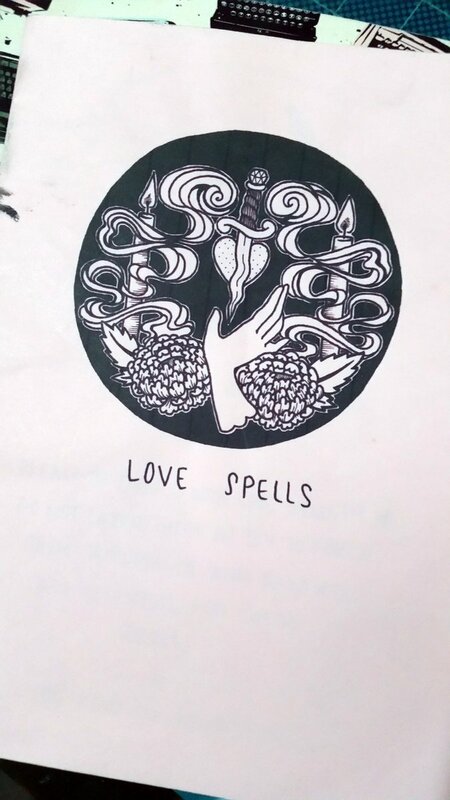 Love Spells by Lillian Cuda or Lilly C as I was introduced to her at the Sydney Zine Fair. Voted by me as cutest stand in the multiverse, Lilly stood out in in a blaze of black and pastels, an emanation of beautiful energy, honest and humble. Her work is from a personal perspective, what has worked for her. I bought these to pass on to some younger family members but actually can’t seem to part with them. Still get a kickin’ buzz and inspiration from her work so haven’t had the heart to hand them over just yet. Hand drawn and coloured crystal identification charts starts our first lesson. Red garnet is an amazing stone as I discover ‘it is the embodiment of love and when worn it helps to revive feelings, stir sexuality and aids to control anger and self destructive behaviours’ – look out! Kunzite is fascinating as it is a mending stone for us broken ones. There are drawings of Flowers For Love, Spells for Self Love. This page includes some fascinating steps from writing ‘I deserve love’ in beetroot juice and holding blooms of Ranunculus when you doubt your awesomeness. This zine comes with a double page of hand drawn stickers to pop on things as reminders of positive love energy. We can bend, mend and banish love in simple steps. This zine is a gem for just that. Her shop for Crafty Witches & Magical Babes can be found here with links to all her ‘awesomeness’.